My mom makes the most amazing fruit preserves. We enjoy her garden fruit all year long this way. 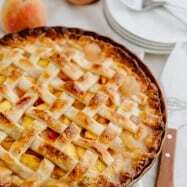 This peach preserves recipe takes a couple days; a longer process than most of the peach preserve recipes I’ve seen online but its worth the wait. It’s not watery like most of the recipes that rush the process. This isn’t speed dating. 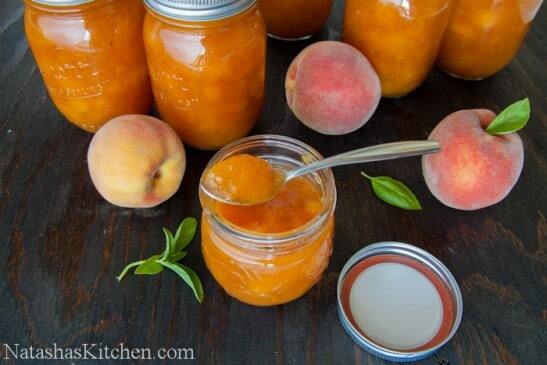 You’ll get to know your peaches over a couple days and and be rewarded with some mighty fine preserves. If you are thinking about Christmas already (as I am), you can make preserves now, slap a label on in December and give them away as gifts to neighbors, co-workers, nursing directors (wink, wink) – I guess this means I can’t eat all of them myself. 5-6 pint-sized jars with lids. I purchased them at Walmart. 1. Fill 2/3 of a large soup pot with water. Bring to a boil. Add peaches for 30 -45 seconds, then remove with slotted spoon or this OXO strainer which I used to transfer them in and out of the boiling water and drain the pot. 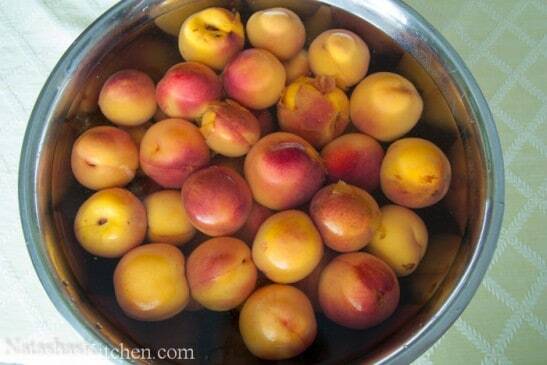 Remove peaches immediately to a large bowl of cold water. 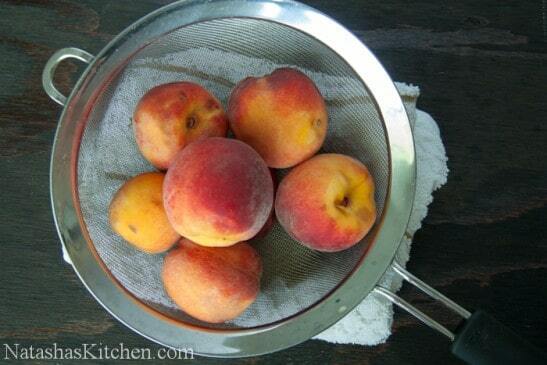 This process is known as blanching the peaches and makes removal of the fuzzy skins really easy. 2. Peel the skin (most of them peeled easily by hand, but there were a stubborn few that required a knife), cut the peaches into quarters and remove pits. 1. 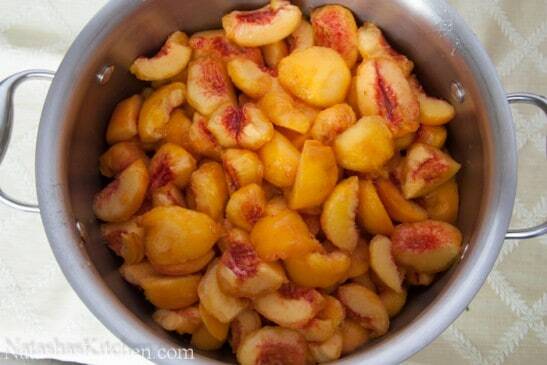 Place all peeled peaches in a large soup pot and squeeze in juice of 1 lemon. Drizzle well with 2 cups sugar, toss and drizzle again with the remaining 1.5-2 cups so the sugar reaches all the peaches. Here’s where you need to use your judgement. If your peaches are very sweet, you may only need 3 1/2 cups of sugar total. You can add more sugar to taste while its cooking, so don’t panic at this step. You’ll do great! 2. 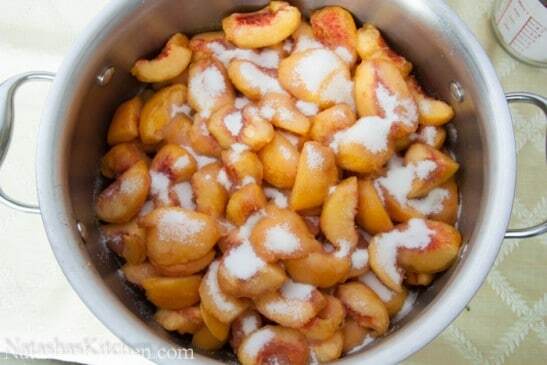 Let peaches sit at room temp with the sugar for about 30min -1 hour, or until sugar is dissolved. 3. Place the pot over the stove uncovered and bring to a light boil, stirring to prevent scorching. Make sure if you see a light boil to stir because the whole pot may not be boiling, just the center. If it stops boiling after you stir it, continue boiling. Once the whole pot is at a light boil, simmer for 10 minutes and turn off the heat. Let the pot stand uncovered until it is just warm to the touch or reaches room temp. 4. As soon as it cools, repeat step 3. You will bring it to a light boil a total of 5 times. This is why it takes 2 days to make. It’s really easy though. Definitely not rocket science to bring a pot to a boil and give it a few stirs :D.
You can go to work and come home then return it to a boil; there’s no “set” time that you need to be reboiling it. If 2 days doesn’t work for you, by all means, take 3 days. 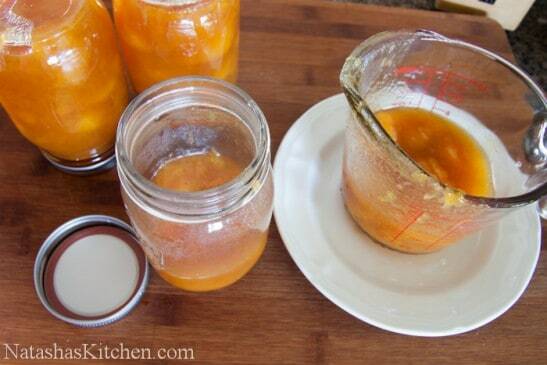 Preserves have plenty of sugar so they won’t spoil at room temp if you leave it on the counter overnight. If you want the preserves to have an even thicker consistency, you can boil it 6 times if you wish. 5. The last time you bring it to a boil you will want to transfer it to sterilized jars while it’s boiling hot. 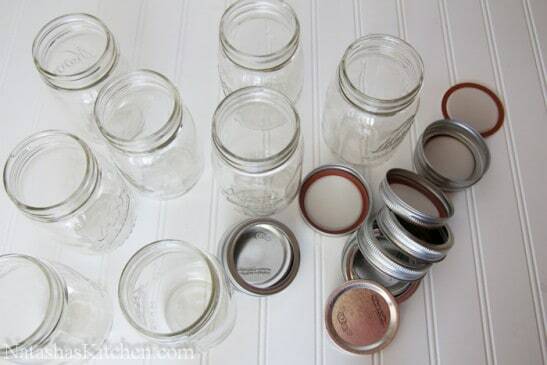 To sterilize your clean jars: wash them and let them dry in the oven at 215 for about 20 min or until completely dry. Boil the lids 5 min. 2. Transfer your boiling hot preserves to the jars using a glass measuring cup and a funnel (least messy method) leaving about 1/2″ space. Tada!! You’ll make it and think “hey that wasn’t so bad.” Well, that’s what I thought the first time I made them. 5-6 pint-sized jars with lids. Fill 2/3 of a large soup pot with water. Bring to a boil. 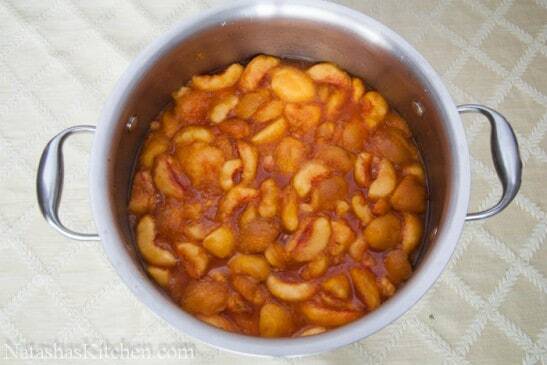 Add peaches for 30 -45 seconds, then remove with slotted spoon and drain the pot. 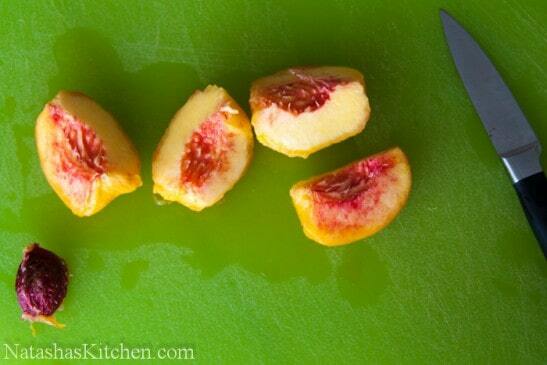 Remove peaches immediately to a large bowl of cold water. 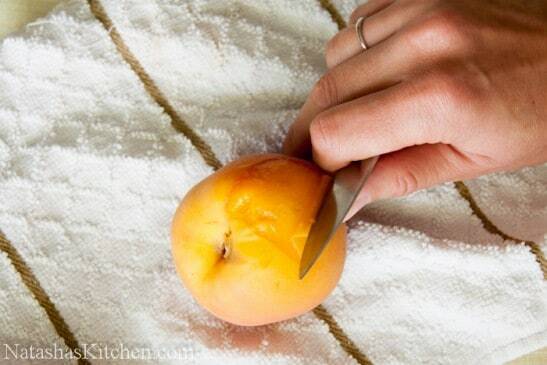 Peel the skin, cut the peaches into quarters and remove pits. Place all peeled peaches in a large soup pot and squeeze in juice of 1 lemon. Drizzle well with 2 cups sugar, toss and drizzle again with the remaining 1.5-2 cups so the sugar reaches all the peaches. 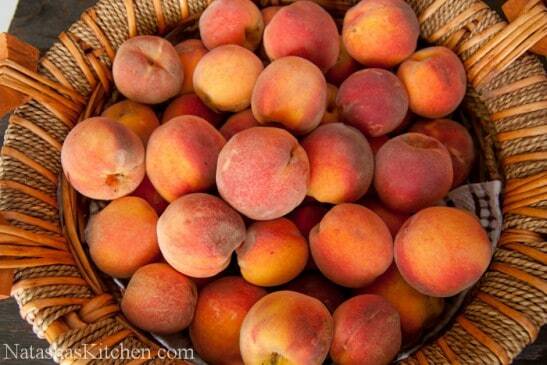 If peaches are very sweet, you may only need 3 1/2 cups of sugar total. Add more sugar to taste while its cooking. 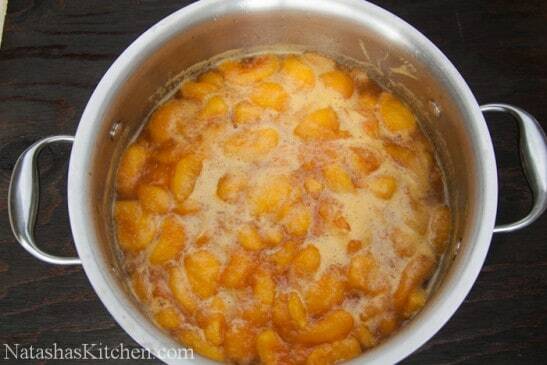 Let peaches sit at room temp with the sugar for about 30 min -1 hour, or until sugar is dissolved. Place the pot over the stove uncovered and bring to a light boil, stirring to prevent scorching. 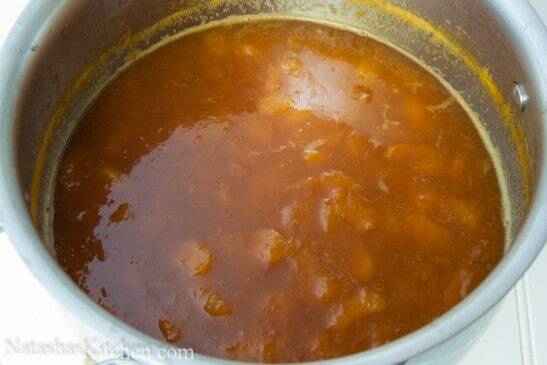 Once the whole pot is at a light boil, simmer for 10 minutes and turn off the heat. Let the pot stand uncovered until it is just warm to the touch or reaches room temp. The last time you bring it to a boil you will want to transfer it to sterilized jars while it's boiling hot. To sterilize the jars: wash them and let them dry in the oven at 215 for about 20 min or until completely dry. Boil the lids 5 min. Transfer your boiling hot preserves to the jars using a glass measuring cup and a funnel (least messy method) leaving about 1/2″ space. Screw the lids on enough to keep a tight seal in place but don't over-tighten them since air bubbles need to be able to escape and place in the oven at 350˚F for 15 min. Carefully remove from oven (don't tighten the lid more or you might disturb the seal that has formed), flip upside down and let cool to room temperature. Hi Natasha, I have a question, as the first peach is peeled are the remaining peaches left in the iced water until all peaches have been peeled? 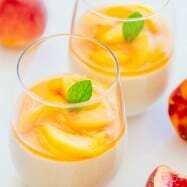 Can freshly canned or frozen peaches be used? Thanks. 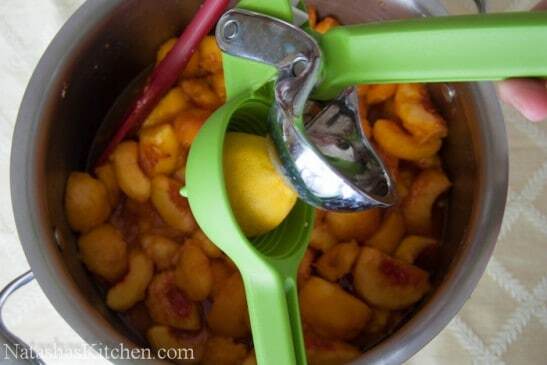 Great recipe … I was gifted with 6lbs of peaches and used your recipe with a few tweaks. Added star anise, cardamom and nutmeg. Thanks for the answer regarding the pectin. I’m buying 25 lbs of peaches from a local orchard this weekend. 2 questions before I start. 1. I am diabetic, I plan do do a small batch for myself using splenda (using real sugar on the batches I’m making for family) do you think it will work out ok with the splenda? So it took 4 days total, about 12 hours of active working hours tied to the kitchen, and I yielded just under 6 pints of jam. $35 for my 20 lbs of peaches makes them about $6 per pint. Good thing it’s freaking delicious! Just definitely, definitely not recommended for a first time jam maker. Next time I think I’ll try a recipe that uses pectin to firm it up to see if I get better yield and less time… I wonder if that woulds sacrifice flavor. 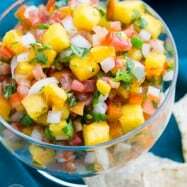 Hi Natasha, this recipe is super easy to make. This year our peach tree had too many fruits for me to handle. I gave away almost half of the crop. Was feeling bad as did not know what to do with the rest, when I came across your recipe. Thank you for your comments! I didn’t realize this the extra steps was due to the color for the peaches. If you used 11 pounds of strawberries, how much sugar would you start with? Hi. I made the strawberry jam. I used 7 pounds of strawberries or 12 cups of pureed strawberries. I used about 9 cups of sugar. It was a little bit sweet so I would probably use 8 next time. I did have to cook it five times. And yes, definitely be careful about scorching. I suppose my next search might be about how to clean off the bottom of my dutch oven. It tasted wonderful though and I was quite happy with it. Thank you for your help and for the cooking method. It works perfectly for someone that doesn’t have longs periods of time available to her. This was my first attempt at jam and I ended up burning it 🙁 I’m turning it into BBQ sauce and I’m going to try again tomorrow. Do Not Place Canning Jars In An Oven! Canning jars are not made for the dry heat of an oven. If you place a canning jar in the oven, you run the risk of, at the very least, damaging your jar by the jar developing hairline fractures that you won’t be able to see, and at the most, shattering. This is SO GOOD!!! I made a batch and it took 2 days, but it was not intensive or hard. The hardest part was peeling and pitting. Blanching did nothing for my peaches because I dont think they were the right ripeness… I guess they need to be really ripe to have blanching work well. 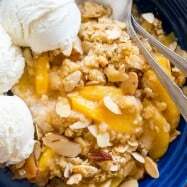 I have 40 pounds of peaches and think I will use this recipe! Thanks for sharing. Quick question. Once everything is done and in the jars, does this get stores in the fridge or at room temperature? Sorry if this a dumb question. This is my first time making preserves. This is my first time trying your recipe! Do I cover the pot when cooling off and leaving it overnight on the counter or should I not cover it? Or take the lids off, clean the rims and seals, tighten a little more and try again with the same seals which, since they didn’t seal the first time should be fine. BTW, just wanted to add that when I made the preserves (posted on July 28th) my batch was dark, probably because I used organic sugar, which is tan, not white like regular sugar. And I did use the slow, 3-day, 6 boil method. Turned out great! Must say, that I think tha main reason it doesn’t turn dark is because the slow process. 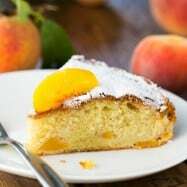 So, thinking that I believe that the amount of peach or sugar is less important than the way it is made. This year we had tons of peaches, and they are not freestone, so making anything but jam just doesn’t turn out as pretty as my grandma’s used to. We are going to have peach jam with peach jam, lol. Must mention, that I did the waterbath method. 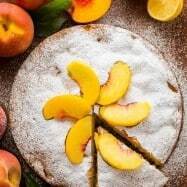 Also made your peach cake, it’s still cooling. This recipe sounds wonderful end easy. 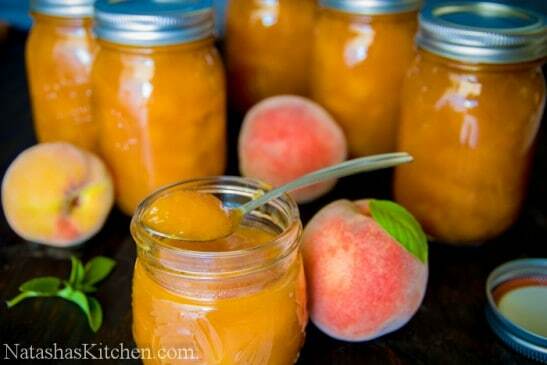 I have several recipes that call for peach preserves, I’ve tried using home made peach jan but it’s to thin. I can’t wait to try this. Can this be store in freezer rather than in jars on a shelf, or will it become thin when I thaw it. I love making jam every year for friends and family. 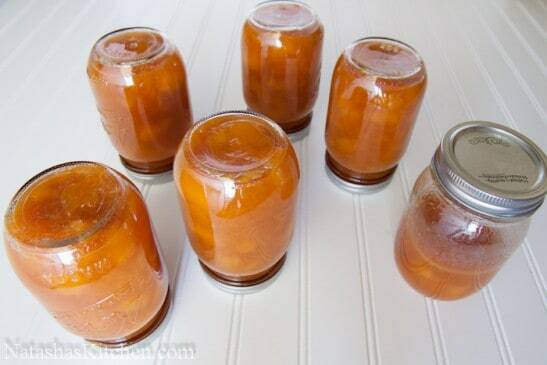 I’m in the midst of making the peach preserves for the first time and am wondering if I need to refrigerate the pot of peaches from one day to the next. just made the preserves with only about 4lb of peaches (my mom brought fresh from Eastern WA), so obviously I reduced the amount of sugar. This turned out great, we had some right away (the ones that didn’t fit in my small jars) with fresh baked bread. Yum yum. My husband said he hasn’t tasted something like this since about 20 years ago. Finished yesterday and let them stand until today. Turned out excellent! Thank you so much! Going to make the most of the British Columbia peaches that we get here in Calgary. Just started my first batch! Will update on the finished product, which I’ll “wet” process in a water bath. 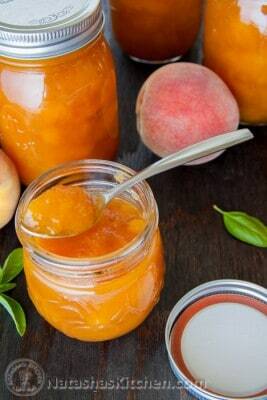 This is the best Peach Preserve recipe EVER ! I love the fact of using a lot of less sugar than any other recipe and no pectin added too. It tastes heavenly .